Get a free Queso at Moe’s Southwest Grill. It’s Free Queso day on Thursday, September 19th. 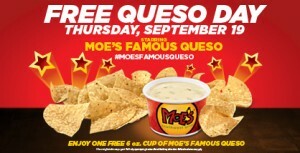 Visit a participating Moe’s anytime on the said date to get a free cup of Famous Queso!